I’m declaring my laser project week finished because I did, in the end, successfully cut something on the laser. Whether that thing fulfills its intended purpose is another question entirely. But look! There is my knitting gauge. It certainly looks like it should work — it is full of holes and everything. It is modeled here with my husband’s 3 year-old unfinished scarf for those cold winter trips to New York. The gauge has a little knitting ball detail on top so I can remember what it is. Here it is telling me that my scarf needles are a size 4. Are they really? I don’t recall, and given the sizing issues I had with my design file I don’t think I trust my gauge. I think this ultimately makes it a decorative object and not a gauge at all. It certainly can’t claim to be any sort of proper ruler despite the little tick marks on the sides. Still, it’s mine and I kind of love it. Maybe I can call it art? – Some projects are trickier than others. – In design, as with anything, it helps to have the proper tools and to devote enough time to their use. – Despite the flaws of the user, lasers are awesome. There was much frustration during my laser reservation last night. The Inkscape file that I so carefully designed wouldn’t print and wouldn’t import into the program that works best with the laser. I had hoped to not waste my 2 hours redesigning, but I had to do that anyway. And this was after begging for help to just get my file into an editable state! By the time TechShop closed I had managed to cut something that looked like a knitting gauge, but the holes are the wrong size, the rulers I included are the wrong size, and the font is completely unreadable. I’ll show you my finished gauge tomorrow and will hopefully find an open time on the laser to reprint it sometime soon. Caution: the descriptions on this page are from my brain and are by no means a technical explanation. If you need more detail holler in the comments and I’ll find someone smarter to answer you. The most important thing to know when designing for the laser is the difference between a raster and a vector. If you have always worked in Photoshop then you have always worked with rasters. The laser interprets any raster image as something that will be etched, not cut. The reason for this is that there are no clean edges in a raster. See the graphic above? The edge of a raster image is made of lots of little boxy pixels. A vector image is made of lines. So to design for the laser you need to download a program that can create vectors. I chose Inkscape, then spent most of the evening Googling for my specific questions because their help files assume you’re an engineer. I’m going to spend the rest of the day drawing circles of various sizes for my knitting needle gauge. When I check in tomorrow my design will hopefully be done and I’ll be on my way to the laser. Wish me luck! 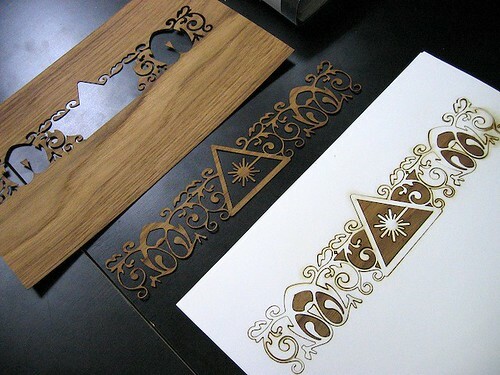 This week I’m going to use the Epilog laser cutter at TechShop to make something for myself. I’ve been considering making a knitting needle gauge so I can finally get my mystery needles in order. Really I just want an excuse to play with the laser. Join me as I design my piece, get my holes the right size, and cut things with laser beams. I’m excited!